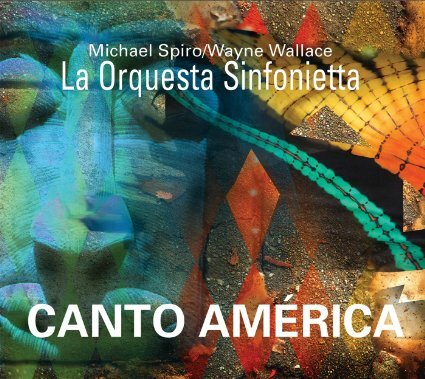 Canto América is the newest release from longtime collaborators Michael Spiro (percussion) and Wayne Wallace (trombone), both accomplished musicians and faculty at Indiana University’s Jacobs School of Music. As listeners familiar with these musicians’ reputations would rightfully expect, the duo’s La Orquesta Sinfonietta is a well-rehearsed, spot on band that plays with both fire and nuance. Formidable instrumentalists in their own right, Spiro and Wallace let their own monster chops take a backseat to the excellent arrangements that are this album’s chief currency. 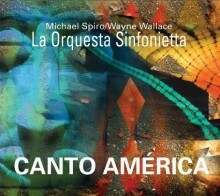 Perhaps the most compelling thing about Canto América is the ensemble’s fluidity between the conventional Latin jazz ensemble (rhythm section, horns, and auxiliary percussion) with the less typical strings that comprise much of La Orquesta Sinfonietta, employed as an integral part of the ensemble rather than a saccharine sweetener. Spiro and Wallace situate this stylistic move in what they call the “genre inclusiveness” of Cuban music, noting in the voluminous 16-page liner notes that classical, jazz, and folkloric music are all equally understood and practiced by the island nation’s working musicians. This group’s attempts at genre inclusiveness succeed spectacularly, largely due to the strong ensemble arrangements. Fans of the standard repertoire will be pleased to see the inclusion of a Latin-flavored version of Hoagy Carmichael’s “Stardust” and the standard “Afro Blue” which, as the explanatory material included with each tune notes, was written by percussionist Mongo Santamaria, rather than by John Coltrane, who made it most famous. The duo’s original compositions and arrangements of traditional tunes are also excellent—-they draw heavily on Latin jazz’s African musical characteristics, pulling heavily upon Yoruba imagery (“El Caldero De Ogun” and “Ochun’s Road”) and employing complicated polyrhythmic structures in their intricate original material (“Hispaniola” and ”El Medico,” the latter of which features a rhythmic solo by Wallace, “the Doctor” himself). Overall, Canto América is a compelling exploration of neglected territory in Latin jazz, informed by scholarship about the African diaspora. This release isn’t all smarts, though–it’s also fun to listen and (perhaps more importantly) dance to.